This trip takes you into one of the most remote parts of Yosemite National Park. You will enjoy magnificent vistas of glacier-carved granite domes and ridges, cascades and lakes, and miles of alpine meadows. 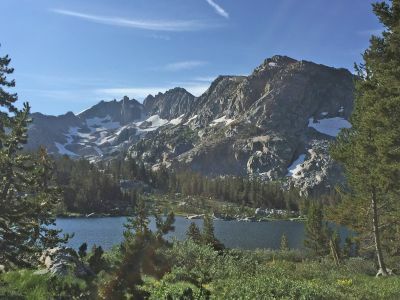 You will begin the hike at the Twin Lakes trailhead, hiking past Sawtooth Ridge and around the base of Crown Point to Peeler Lake where you will enter the Yosemite backcountry. 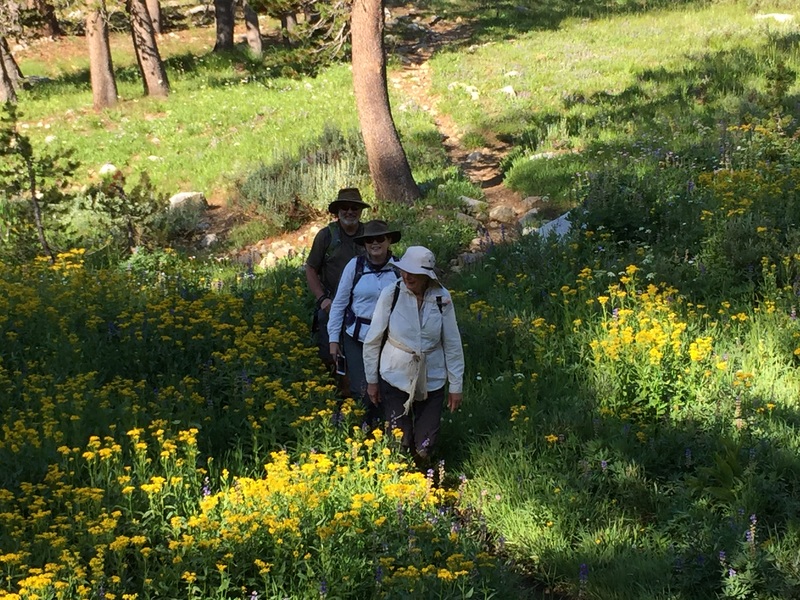 The hike will follow miles of meadow into Kerrick Canyon before climbing into the Stubblefield and Tilden drainages. You will traverse more meadows as you ascend the Tilden Canyon up to beautiful Tilden Lake and then the long meadows of Jack Main Canyon to Dorothy Lake. You will leave Yosemite at Dorothy Lake Pass, dropping down to Lower Piute Meadows and finally out to Leavitt Meadow. Offered through Virginia Lakes Pack Outfit. Arrive at the Mono Village coffee shop, (Twin Lakes, west of Bridgeport) by 7:00 AM. A pack station employee who will arrange for your breakfast at the coffee shop and pay the fee to park your vehicle in the Mono Village backpacker parking area. Begin at Twin Lakes; Ending at Leavitt Meadow, off Sonora Pass. Hikers should be able to walk ten miles, 2,500’ elevation gain and/or loss. You should acclimate to 8,000’ to 10,000’ for 1-3 days prior to the trip. The trail starts through open pine forest and then through an aspen grove before crossing into exposed sagebrush and Manzanita covered alluvium. The path moves in and out of an aspen forest as it climbs a series of switchbacks to 8,258’ Barney Lake at mile 3.9. 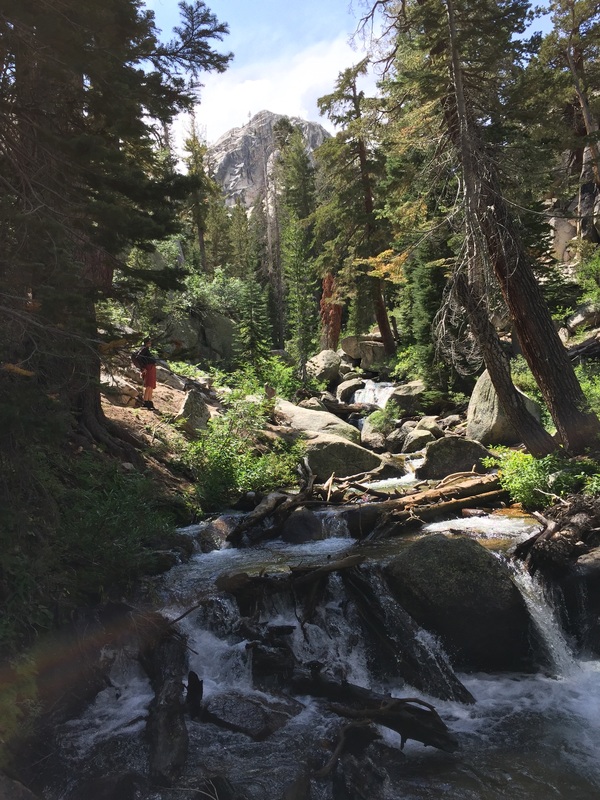 There are some stream crossings further up, but the lake is a good place to refill your water bottle before starting up the trail. The route climbs steadily through a dry talus slope above the western shoreline and swampy inlet of Barney Lake before re-entering the forest. Consider enjoying lunch at the cascades by the second Robinson Creek crossing. The trail then climbs more steeply to the 9,200’ junction to Peeler Lake at mile 6.7. The trail tops out in another 0.7 miles at a 9,600’ ridge above Peeler Lake before dropping to the shoreline of the 9,489’ lake. This is a beautiful lake so plan to spend some time for a pleasant swim or rejuvenating foot soak before continuing to Kerrick Meadows. The route enters Yosemite National Park at the western edge of the lake, dropping 100’ in 0.7 miles into Upper Kerrick Meadow to the junction with the Buckeye Pass trail. Depending on water availability, our camp is at the edge of the meadow about 0.1 miles northwest of the junction. This is a day to enjoy the meadows. Return to the junction and follow the meadow south, passing the junction to Rock Island Pass 1.4 miles below camp. The route follows Rancheria Creek through a series of long meadows interspersed with pine forests. 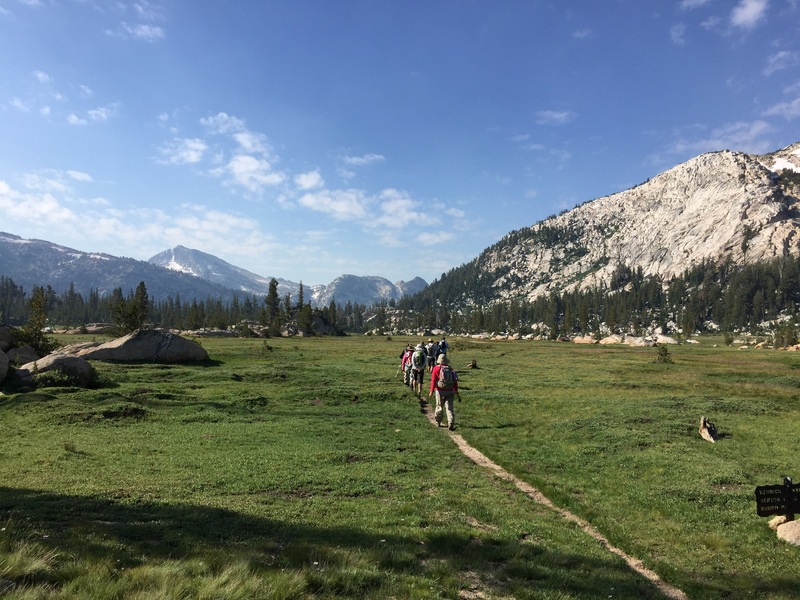 Lower Kerrick Meadow, located on the west side of the creek above the stock fence, is a favorite camp with views of granite domes across the meadow. There are wonderful bathing pools next to the section of trail below the stock fence. This easy day makes a short side trip inviting. Consider a visit to pretty Arndt Lake which will add about a mile and 80’ of gain and loss to your walk. Watch for the Arndt Lake outlet stream just before the trail enters a narrow rock-walled canyon on the west side of the lake. Follow the stream up a wide, sloping meadow to the lake. 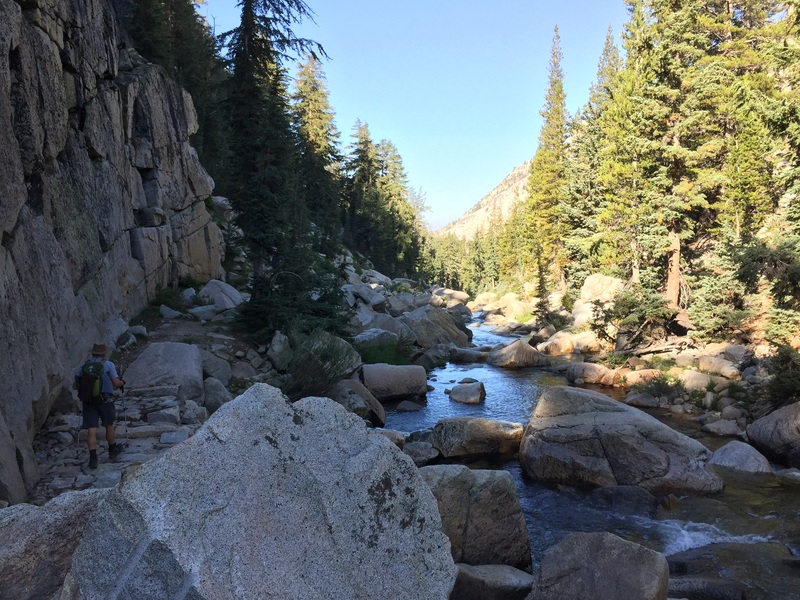 The route continues down Rancheria Creek to the junction with the Pacific Crest Trail in 0.7 miles. Follow the trail to the right toward Wilma Lake, descending moderately 1,200’ through forest, with occasional short climbs, to the junction to Bear Valley at mile 4.3. Follow the Pacific Crest Trail to the right to cross Rancheria Creek. This can be a difficult crossing at high water, but there are rocks and logs upstream and downstream from the trail crossing if the crossing is dangerous. Check the comments on Guthook’s PCT Hiker app for recommendations during high-water periods. The rocky trail then climbs steeply out of the canyon through sunny, open forest, gaining 800’ in 1.3 miles before dropping 1,000’ in 1.1 miles to the Stubblefield Creek camp. The climb out of Stubblefield to Macomb Ridge is steep, sunny, and rocky, with an elevation gain of 1,200’ in 2.4 miles. Then, the trail descends 500’ in under a mile into the Tilden Canyon Creek drainage and the junction to Tiltill Valley. 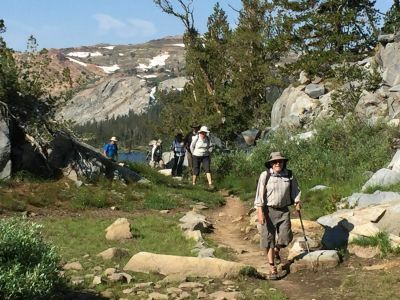 Follow the Pacific Crest Trail to the right for 500 feet to the Tilden Lake junction, turning right to follow the creek to the lake. The lightly used trail climbs rather steeply at first, but is mostly a gentle ascent of 600’ in three miles through forest and meadows to the southern end of the lake. Camp is on the opposite shore, so continue on the trail to cross the outlet of the lake and then walk 2/3 mile along the western side of the lake to camp. The Pacific Crest Trail route past Wilma Lake is shorter, so beautiful Tilden Lake is very lightly used. 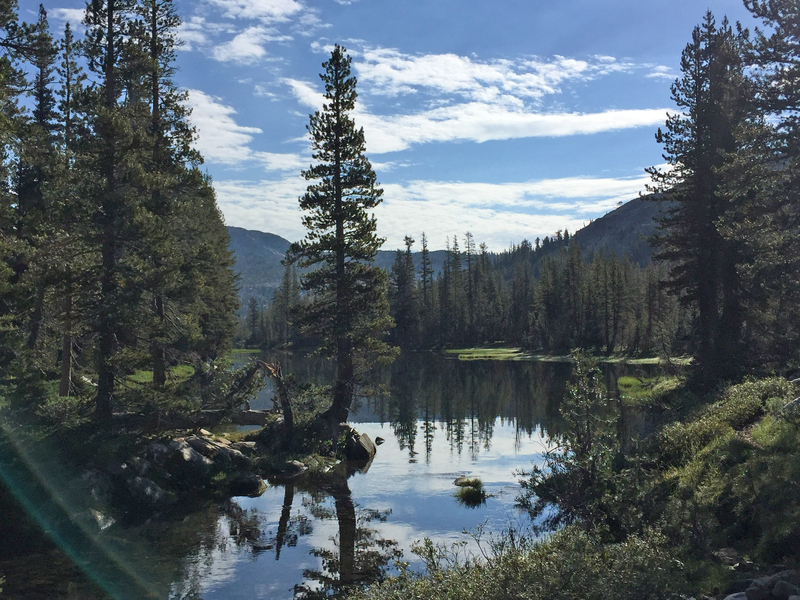 Enjoy this picturesque lake or walk up Tilden Creek toward Mary Lake. Return 2/3 mile to the trail at the outlet of the lake. The route then drops 700’ in 1.4 miles through forest to Jack Main Canyon to rejoin the Pacific Crest Trail. Turning right, the route soon leaves the forest to climb gently along the long meadows and sections of forest of Jack Main Canyon. The trail steepens as it leaves Grace Meadow, passing in and out of forest to the Bond Pass junction at mile 7.9. 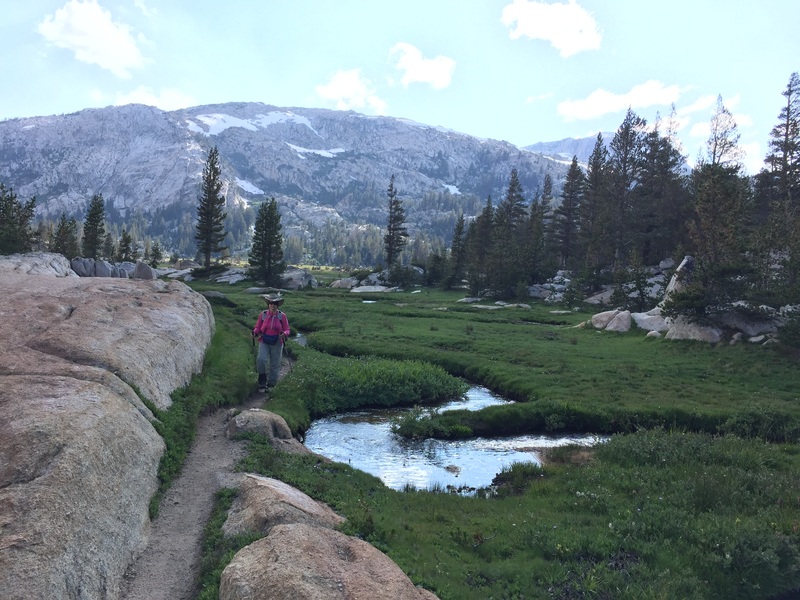 The trail levels out and then follows a large meadow to Dorothy Lake. The stock camp is on the southwest side of the lake. Expect a number of stream crossings. Return to the trail and follow the north shore of the Dorothy Lake to the east. 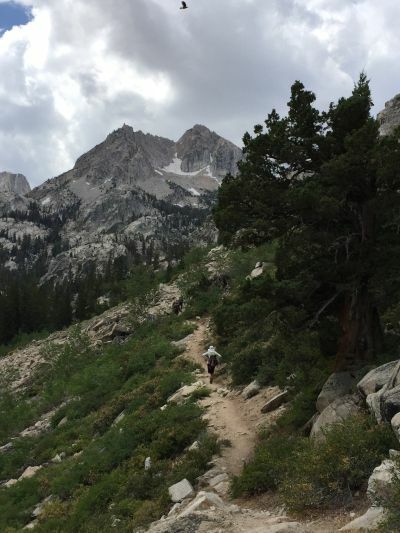 Climbing easily over Dorothy Lake Pass, the path then descends away from Yosemite National Park in open, granite terrain past beautiful Stella, Bonnie, and Harriet Lakes. Leave the Pacific Crest Trail, turning right at the Cascade Creek junction toward Cascade Falls and Piute Meadow. 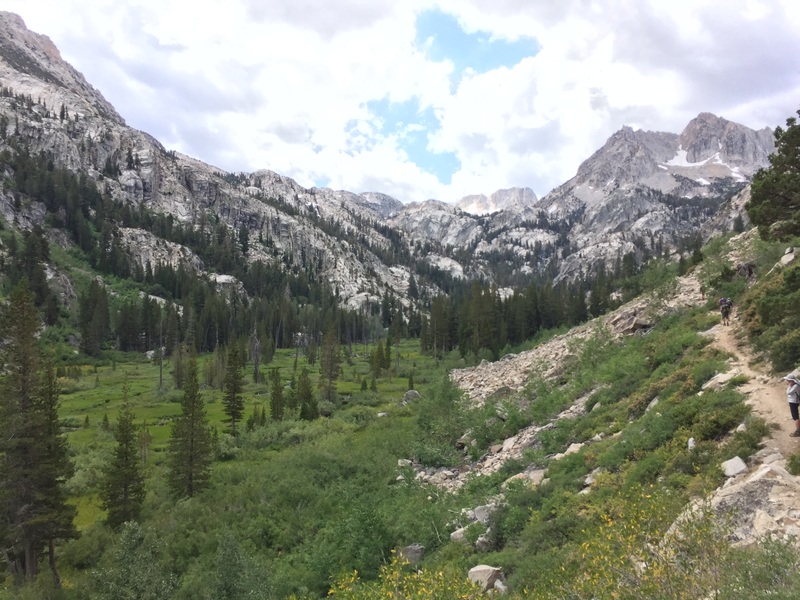 A fairly steep descent of 900’ in 1.4 miles to the Upper Piute Meadows junction offers good views of distant peaks. 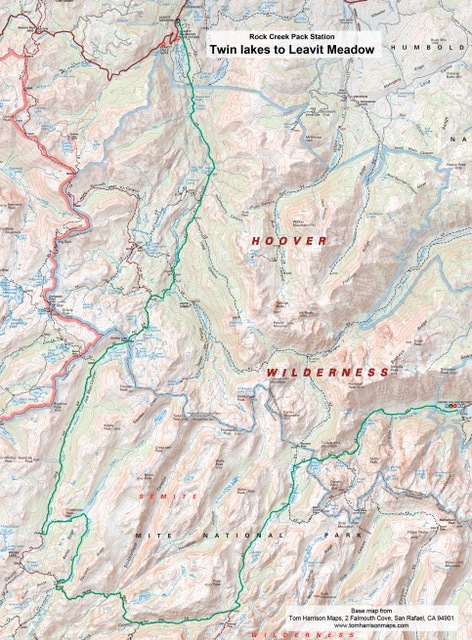 The West Walker River drainage presents a challenge with numerous junctions. 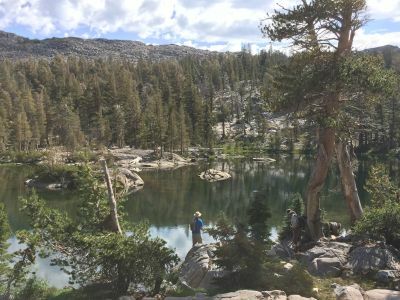 Turn downriver at the Upper Piute Meadows/Piute Cabin junction and then right at the Long Lake junction in 0.3 miles to follow the trail along the east side of Lower Piute Meadows for one mile before turning into the meadow to a comfortable camp at the edge of the meadow. The adjacent Walker River has some great bathing pools. One might worry that leaving Yosemite National Park means the loss of beautiful mountain scenery. The route today won’t disappoint, tracing the many moods of the West Walker River through scenic forests under remarkable basalt capped mountains. Some maps indicate the need to cross the West Walker River, but you should stay on the east side of the river until you cross the bridge at the end of the day. The trail leaves the West Walker River as it continues toward Leavitt Meadow, passing the Long Canyon junction at mile 1.1, and then rejoins the river near the Fremont Lake junction at mile 1.8. The path is generally downhill, occasionally leaving the river to ascend low ridges near the Hidden Lake junction and Roosevelt Lake. Watch for a couple of particularly nice lunch spots at Lane Lake. The trail passes the junction to Secret Lake at mile 6.4 as it drops out of the forest to contour along the dry, sunny slope above the meadow. A bridge crosses the river to the Leavitt Meadows Campground. Walk upriver through the campground and through a small grove of trees to the trailhead parking area. The pack station will arrive at the trailhead parking area by 2:30 to drive you back to your vehicles at Mono Village. Please note that this represents the planned itinerary. Weather or other factors may affect the choice of campsites and daily travel. All decisions are made by the Head Packer with attention to the safety and comfort of guests and stock. *Mileage, gain, and loss based on Tom Harrison maps. Distances between junctions and gain/loss is based on TOPO! Software. . Campsite latitude and longitude information is based on Yosemite National Park Stock Camp locations. You may bring your own tent up to 10 pounds that is in addition. The PCT 28 day trip allows 35 pounds of duffel. Bring belongings in stout canvas or nylon duffels; side zipper recommended, ideal size approximately 14" x 32". It is a good idea to use a large plastic bag INSIDE of the duffle to protect contents from external moisture. Sleeping bags can be in separate duffels --again, line the inside of the duffle against rain. Place all cosmetics, soaps, medications, etc into small plastic containers with close-fitting caps, THEN into sturdy resealable plastic storage bags. If anything breaks or bursts from altitude changes, the plastic bag contains the spill. When possible, it is a good idea to transfer alcoholic beverages to sturdy plastic bottles with well fitting caps - it will save weight and protect against breakage. Footwear. For this trips a medium-weight pair of hiking boots. We do not recommend lightweight hikers or tennies since they give little ankle support and the soles are often thin. Camp Shoes. A lightweight pair of tennies or Tevas to wear in camp. This will reduce vegetation damage at our campsites. A day pack. It should be large enough to take water, extra clothing, rainwear, camera, etc during the days. Sleeping Bag. Most summer trips are warm and a bag rated to about 25°F will be plenty warm enough. We much prefer down bags, and good quality ones at that. Your bag should weigh in around 3 pounds. Sleeping pad. A 3/4 or full length closed cell foam or Thermarest. If you bring a Thermarest also bring a repair kit to fix pesky holes! 2 pair synthetic liner socks. 2 pair heavier synthetic or wool blend socks. Long underwear top. Capilene, some other synthetic or the new pure Merino wool types. Warm pants. Tights or Expedition Weight Capilene. Warm shirt. Synchilla or R2 weight works well. GoreTex Jacket and Pants. A lightweight set is sufficient and heavy bulky clothing is unnecessary. Side zips on the pants should be long enough to slide over boots. Jacket must have a hood. Do not skimp on your rain gear. Nylon ponchos are not acceptable. Lightweight capilene or similar gloves. Warm hat. Synthetic or wool. Water Bottles. Two quart (1 liter) wide mouth bottles and/or a hydration system holding up to 50oz. (2 liters). Don’t bring bike bottles or any bottle that doesn’t have a wide opening. Headlamp. --and a spare set of batteries! Pocket knife. Swiss army style. Personal toiletries. It is not necessary to smell like a rose each day so do not over do it. Ear plugs are great to have in a noisy tent. Personal Medical Kit. The guide will carry a large kit so yours will predominately consist of foot repair items, mild pain killer such as Advil and bandaids. Sunscreen and lip screen. SPF 30+. A 1oz. bottle will be enough. Make sure the lip stuff actually contains a sunscreen. Ski/trekking poles. These are not essential, but can be handy on the trail. It is your choice, but they do save wear on the knees. Plastic trash bag. Handy for keeping gear in outside the tent should it rain. We provide the all meals on scheduled trips. You can bring your favorite "on-the-trail" snacks. 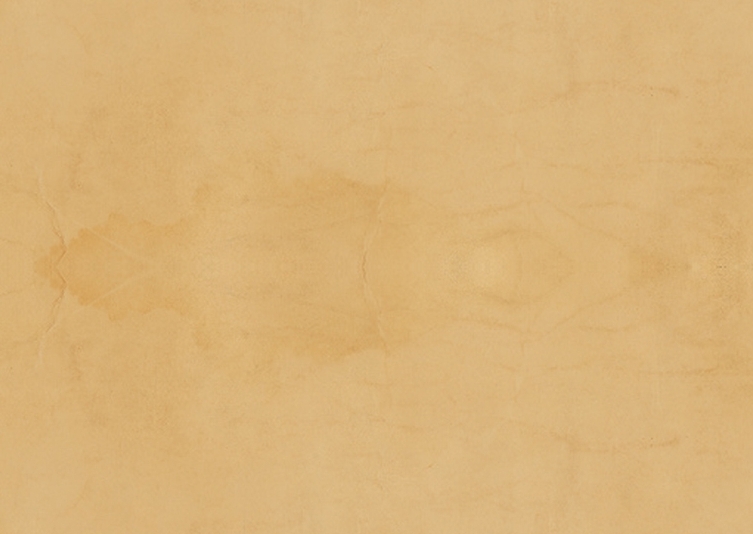 You can purchase quality topo maps at TOM HARRISON MAPS.